Half-length, authentic bacon, from Canadian SPF pigs, carefully aged to have a rich flavor. 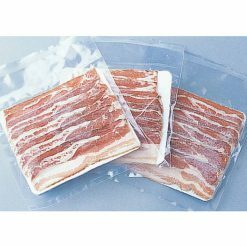 Bacon is very versatile in that after thawing, you can eat it as an ingredient in a number of dishes. Package contains 150g (3 x 50g bags). The Canadian SPF pigs that were raised to cure this bacon were not given antibiotics or other chemicals. SPF stands for specific pathogen free- this term is used to describe pigs that are free from a list of specified pathogens. 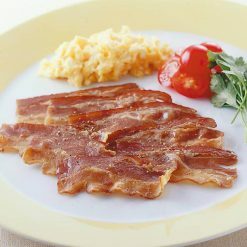 Bacon can be eaten with your breakfast (as a side to eggs), in a sandwich (with lettuce and tomatoes), in a salad (as your salad topping), in soup (as a salty source of protein), and recently even in your desserts (with peanut butter or in ice cream). Bacon can truly be eaten during all times of the day! Please thaw in the refrigerator or place the bag under running water to thaw. Please cook the bacon. When thawing under water, the water should be slightly cool to the touch. Leave the meat under the water until it has completely thawed. The water does not need to run rapidly- a steady stream would do to defrost your bacon.